Did you know that there is a photo gallery at the bottom of every recipe post? If you make a recipe from here, you can upload your own photo to the gallery on that recipe! You can also do that with your own recipe–if you submit a recipe without a photo, you can add the photo the next time you make the recipe by uploading it to the gallery on your recipe. How fun is that? Multiple photos can be uploaded to each recipe’s gallery. I think it will be fun to see everyone’s photos of how their recipes turned out! Okay, back to today’s giveaway! I have a hand blender, which is about the most useful thing you can have in your kitchen. And you can use it for soapmaking, too! I have this same hand blender and I LOVE IT. For a chance to win: Just leave a comment on this post! One winner will be drawn by random comment number to receive the hand blender. Eligible entry cut-off is midnight Eastern (U.S.) time tonight (May 7). This post will be updated with the winner by 9 a.m. Eastern (U.S.) time tomorrow (May 8). Return to this post to see if you won. Note: You must be registered to post a comment. Sign up (it’s free!) and join us! *See the winner of yesterday’s giveaway here. Update 05/08/10: The winning comment number, drawn by random.org, is #2, Vicki. Email me at CITRgiveaways(at)aol.com with your full name and address for shipping! I don’t know if it is too late for the drawing, but either way, I love my hand blender. It is the best way to puree potato soup the way my dad used to. I would love to have a hand blender! And I love the Chicken Lady’s blog! It’s been a busy week here. I’m just now getting registered for Farm Bell Recipes. I’d love to be entered in the drawing. Thanks so much! Whoo-hoo! I’d love to win that. I would love to have that one. Mine is currently relegated to my soapmaking. I’d love one for kitchen duty, too! We use one at work all the time. So much handier than getting out the big mixer. I would love to win!! I want to win too. I’m off work. I would use this mixer for so many things! Happy Friday everyone! Love the FarmBell website and all the recipes. I need to add a few of my own this weekend – been so busy this week to do it. I’m so happy to finally get registered. I’m sure Susan is out milking by now. this hand blender would save scalding myself with hot soup in the regular blender. I have found recipe heaven! Sour cream cookies! I know what I will be doing later on today. Ooo! I’ve always wanted one of those!! Gee, didn’t know you could use to make soap; now I’ll need to win 2! Just what I need to whip up my Quick Carrot Cake and Cream Cheese Frosting. Oh….I would love to win this. I had one years ago like it but in one of our moves it got lost. So “Pretty Please” pick me as the winner. Mine just died last week. BooHoo, I miss it so. I’d love to win a new one. Would love a chance to win this! Suzanne you have great prizes. Another item I do not have, but could really use. Love all my new friends also. All I can think of is this “how wonderfully handy for making my favorite cauliflower soup!” I have a cheap ($12) blender, so you know how long it has to churn to get close to puree :> And dealing with transferring hot, steamed cauliflower into the blender is a bit of an adventure! I really love the Farm Bell Recipes!!! It’s a giant web cookbook/idea book! Please enter me for the hand blender. ALSO, “HI!” to all my new friends on the Farm Bell site. Suzanne, you are a web genius!!! MIne just quit. I’d love a new one. My mom-in-law loves hers. I’ve always wanted to try it out. New kitchen gadgets are always fun! OOOOHHHH! I would love to win that. If I don’t 🙂 I will have to remember this gadget when I am at a store. For some reason I only think of things like that when I need them, not while I’m actually shopping! Would love to win this give away. Great prize! Keeping my fingers crossed! PS; Love the recipes. And I thought I had all the gadgets I would ever need. Nope, here’s another one! Would love to win it. stick blender yeah! sign me up. These are great. I used to have one and I wore it out. I never got around to getting another one for some reason. Winning one would be great. My hand blender is resting in peace in the kitchen. Thanks for the chance to win a new one! finally logged in and ready to participate! THanks for the giveaways! oooh! I need one of those! Sign me up please. OOOOOOOOOO, I want that thing!!! What a great prize! Thanks Suzanne! Would love to have a hand blender! This would be great for making whipped cream! Ohh, ohh! Me me me!!! Count me in! I could so use this. My main one I now use for soap — could use one for the kitchen!! I have a hand blender, but I’d love to have another one so I can use one for food and one for non-food uses! I would like to have one of those. My mixing arm is getting slow these days. Thank you for creating the Farm Bell section. Great idea, and I look forward to sharing and receiving ideas from everyone here! My fingers are crossed. I’m putting together my recipe box this weekend…I have several hours dedicated to getting that done…and then I have to start cooking all of them…. Me too! Please add my name to the hat. I’d love to have one! I’ve been wanting one of these for the longest time. Great giveaway. I bet this would be a very handy tool to have in my new kitchen! Good Morning all from the Hill’s Of Tennessee! I have never had one of these or used one either….I would love to give it a try..
Oh! I’ve been wanting one of these! I’m really enjoying the new recipe site, btw. Lots of great sounding dishes I can’t wait to try out! I have never had one of these, but I would sure like to. Enter me, please. Love your new Farm Bell Blog and Recipes! I would love to have one of these! Thanks for the chance to win. Cool, a hand blender! I sure could use one. I put a stick blender on my wish list and every morning I scramble into the kitchen to see if the stick-blender-fairy has brought me one. What? Not yet? Oh well. She must still be off vacationing somewhere exotic. Will you please enter me into your drawing? I have new recipes to try! I love this site!!! Love finding new fun recipes! Thanks for the chance to win! Those blenders are good for a jillion chores…….hoping this is my lucky day! I would love the hand held blender!! Count me in. My last blender burned up I used it so much would another. I like the idea of photos with the recipes! So many times I’ll choose a menu with a pic. over one without! I love this! My in-laws have one and they are perfect for mixing a quick latte! Would love to have this in all of my kitchen paraphenalia. Thanks for making this such an enjoyable site. I visit everyday! Would very much like the stick blender. Mine is on its last leg! Thanks. I’d really love a stick blender! I’ve always wanted to try making soap. Ohhh, this does look super handy, would love to win! Would love to have one of those!! Good Morning. Could I be entered in the giveaway for the hand blender? Thank you. I would love one of those mixers. I have been coveting one of them since you first posted a picture in your soap making tutorial! Oh, I have heard these are wonderful. I would love to win one and be able to try it for myself. Ilove it, I want it, I NEED it!!! I could really use a stick blender. My old stand blender just isn’t doing the trick anymore! I’ve always wanted one of those! Sign me up. I’m feeling lucky! I have wanted one of these for years! Thanks for the opportunity to win one. I would love to be entered in the draw. Thanks! Please enter me into the drawing. I would love to use this little gizzmo for making cream soups, etc. I would like to enter! Ohhh! This has been so much fun this week!! I would love to win a hand blend, I have never had one. I have always wanted one of these!!! I would love to have a hand blender. You can never have too many gadgets! You have the best gadgets. Count me in the draw for this hand blender, please. Stick blenders ROCK! Yes, please! Hmmmm, I could use that. Thank you for the chance, am keeping my finners crossed too. I would love this blender!! This looks so handy! 🙂 I love your site Suzanne! It’s an escape for me every day. I used one of these hand blenders with a friend to make soap last year. Seems quite handy. Just found your site today for dough enhancer! I’ve already spent a few hours looking at all of the great recipes. It’s now one of my bookmarks. Yea! Definitely think I would use one of these if I had it! My daughter would love this blender with her in college!! Love this…You cont. to be the best part of my day. They say the third time is the charm. How about the fifth time? I feel lucky today.Put me in the draw. I utterly adore my stick blender for thick blended soups, quick pureed butters and whipped cream … and my daughter keeps borrowing it for her smoothies. I can see she needs one of her own soon! Yes, I would love that precious little appliance. Oh Cool! Not only do I want a hand blender but I NEED a hand blender. Pick me 🙂 Hehehe… Love the idea about the photo gallery on each recipie. I’ve been using the same handblender for soap and for food, so this would be handy! Oh, I hope I’m the lucky number picked. Oh I would love to have a hand blender, all the things I could create with ONE! let me count the ways! This is so GREAT!!!! The photos sound like fun and I would love the hand blender. Would love to try this with making soap!! I would love to have a hand blender! Throw my name in the hat too! ohhhh that would be nice, i have one i love using for my soaping, now i need one in the kitchen! Pick me! Pick me! I’d love to have a nice stick blender. Love this new blog, too. 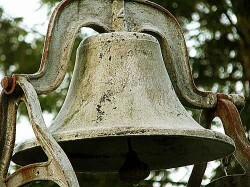 I really love the Farm Bell! So easy and quick to find what you’re looking for. Thanks again for all you do! Hi Suzanne, I am so happy to see your new site up and active. Thank you for all the hard work you put into this. Your photos are just awesome. Count me in for your drawing please. Wow, that looks like a handy tool. It would certainly be put to hard work in my kitchen. Thank you again. I would love this blender. 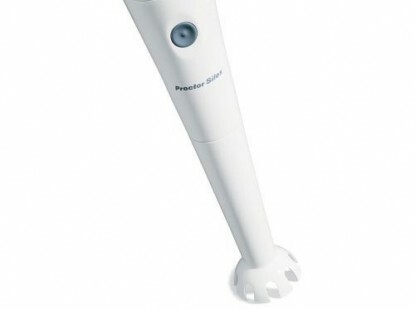 I would so love to win this hand blender! Hello Suzanne – just started following your site – its wonderful – Thank you for all you wonderful info! Boy do I feel stupid! I haven’t been home a few days, so have missed out on a lot of your fun here. then it took me forever to figure out how to leave a comment for you! Got it all figured out. I already feel like a winner! I want to make soap!! I want to win!